The GCCG is extremely proud to have been announced as the National Car Club of the Year. 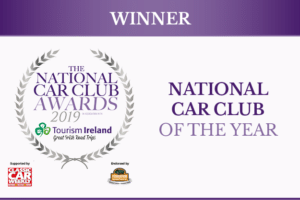 The prestigious National Car Club of the Yearis presented in association with Tourism Ireland, supported by Classic Car Weeklyand endorsed by the Federation of British Historic Vehicle Clubs. The National Car Club Awards celebrate, recognise and honour the achievements of the nation’s car clubs, the enthusiastic people who run them and the remarkable cars they preserve and cherish. The GCCG had stiff competition from: BMW Car Club GB, GT40 Enthusiasts Club, Maestro & Montego Owners Club, National Street Rod Association, and the The Rover Sports Register. Club representatives Alan Webb Moore (also shortlisted for club ambassador award), Mark Wells (who tirelessly spent many late nights filling the required forms for nominations), his partner Malcolm and other GCCG members attended the awards ceremony during the NEC Classic Restoration Show. The GCCG also got an honorary mention for live action on their stand.